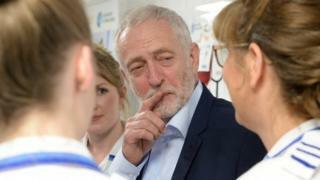 Jeremy Corbyn has said Labour would provide free car parking at all NHS hospitals in England to end what he called a "tax on serious illness". Mr Corbyn said the estimated £162m cost would be paid for by an increase in tax on private health insurance premiums. The plan has the support of NHS unions. But the Conservatives said Mr Corbyn "wouldn't be able to deliver it" - and the Lib Dems said Labour had voted with the Tories for a hard Brexit that would mean "less money for the NHS". The Labour leader announced the plan during a visit to nursing students in Worcester. He said hospital parking charges placed "an unfair and unnecessary burden on families, patients and NHS staff". "Our hospitals are struggling from under-funding at the hands of Theresa May's Conservative government, but the gap should not be filled by charging sick patients, anxious relatives and already hard-pressed NHS staff for an essential service." The Unison union says some hospitals are charging staff, including nurses, nearly £100 a month to park. Labour says increasing the tax rate on private health premiums from 12% to 20% would raise an additional £377m. Reality Check: Will free hospital parking cost £162m? The claim: Labour could make car parking free at NHS hospitals for £162m. Reality Check verdict: The £162m is derived using an extrapolation that is unreliable. The Barnett formula is also likely to add about another £30m and logistical costs could add more. Labour has promised to make car parking at NHS hospitals in England free, if it wins the election. Hospital car parking fees were abolished in Scotland and Wales in 2008, although a small number of hospitals still charge as they remain tied in to contracts with private companies that manage their parking facilities. Fees may be charged in Northern Ireland. In England, whether to charge fees is a decision for individual trusts, with some making parking free for particular patients, such as cancer patients or those using dialysis, or for parents staying overnight with their children. It says three quarters of private insurance policies are taken out by employers "on behalf of wealthier, high-skilled employees". Unison general secretary Dave Prentis said: "The cost of hospital parking is heaping excessive financial pressure on health employees who've gone for years without a decent pay rise." Rehana Azam, national secretary for public services at the GMB union, said hospital parking is free in Wales and most of Scotland so it is "only right" for people in England to get the same treatment. A Conservative Party spokesman said: "With Corbyn in charge of our Brexit negotiations, the economy and our NHS would be at grave risk. There would be less money to spend in hospitals, not more." A Liberal Democrat spokesman said: "Only the Liberal Democrats are being honest with the public about the need to all chip in a little more to rescue the NHS and care."